Kamar Baldwin had 25 points in Butler's loss to Villanova on Saturday. PHILADELPHIA — Trailing by double digits and missing two key starters, No. 1 Villanova was plummeting toward its worst week in five years. Donte DiVincenzo wouldn’t let it happen. DiVincenzo scored a career-high 30 points, Jalen Brunson had 27 and No. 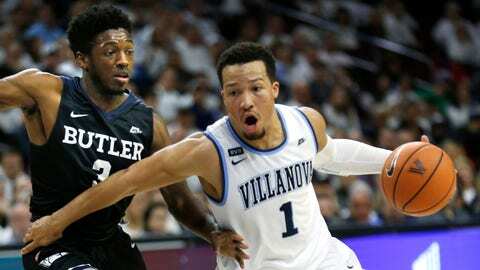 1 Villanova bounced back from its second loss of the season, rallying past Butler 86-75 Saturday. Omari Spellman added 10 points and 11 rebounds for the Wildcats (23-2, 10-2 Big East), who avoided losing consecutive games for the first time since March 2013. The injury-depleted Wildcats were coming off a surprising home defeat to last-place St. John’s three days earlier. “The loss made it obvious we had to get back to playing Villanova basketball,” DiVincenzo said. Kelan Martin scored 30 and Kamar Baldwin had 25 for Butler (17-9, 7-6), which handed Villanova its first loss of the season on Dec. 30. The Bulldogs had won three straight vs. Villanova, and looked they might continue the streak when they led by as many as 13 in the first half behind Martin’s hot hand. The Butler senior forward shot 8 for 12 from 3-point range, hitting two straight 3s to spark an early 11-0 run and two more in a row that gave the Bulldogs a 36-26 advantage with 4:28 left in the first half. But Villanova closed the half on a 9-2 run, capped by a 3-pointer from freshman Collin Gillespie right before the buzzer, and took its first lead two minutes into the second half when DiVincenzo followed a game-tying 3-pointer with a pair of free throws. DiVincenzo scored 20 of the team’s 51 second-half points — including a big basket with just under two minutes to go after Butler sliced the deficit to four — to help Villanova make up for the absences of injured starters Eric Paschall (concussion) and Phil Booth (fractured hand) and hold off the upset-minded Bulldogs in front of a sellout crowd of 20,603. Villanova head coach Jay Wright said DiVincenzo also had his “best defensive game of the year” at the top of the zone. And he praised the defensive efforts of freshmen Gillespie, Jermaine Samuels and Dhamir Cosby-Roundtree, all of whom saw their roles expanded for the shorthanded ‘Cats with Gillespie getting his first collegiate start. Butler: Even though they’ve lost six games in the Big East, the Bulldogs are showing they can hang with anyone in the league. Four days before Saturday’s near-upset, they took No. 5 Xavier to overtime before dropping a 98-93 decision. Villanova: The Wildcats, who have sat atop the rankings for eight of the last nine weeks, will almost certainly fall off their No. 1 perch when the new AP poll is released Monday. And even after Saturday’s win, their streak of four straight Big East regular-season titles remains in jeopardy with Xavier challenging for the crown. When asked about Villanova’s nearly five-year-long stretch of never losing two games in a row, Butler head coach LaVall Jordan praised the Wildcats program. Wright said Booth, one of the team’s top guards, is “still a few weeks away” while Paschall remains in concussion protocol and is “a number of days away at a best-case scenario” after missing his second straight game Saturday. Without those two, Villanova is down to eight available scholarship players, half of whom are freshman. And two of those freshman — Gillespie and Samuels — missed significant time this season with broken hands. Butler: The Bulldogs open a three-game homestand, starting with Georgetown on Tuesday. Villanova: The Wildcats have a tough week coming up, hitting the road to face Providence on Wednesday before a showdown with Xavier next Saturday.